How Does Chiropractic Care Actually Work? Chiropractors adjust the alignment of the spine to help the body function at an optimum level and facilitate proper function of the nervous system. When your spine is perfectly aligned, important nerve signals are able to be transmitted without any interference. When your spine is out of alignment, the nerve signals have trouble transmitting. A properly functioning nervous system is so important because the nervous system controls every cell and organ in your body. A lot of people think they know what chiropractic care is, but they don't actually understand the reasoning behind the methods. Yes, chiropractors help with neck, back and many other types of pain by realigning the spine. But why is correct alignment of the spine essential? When you receive an adjustment do you actually know the medical and scientific reasoning behind it? Why do you experience the feeling of immidiate relief after you are adjusted by your chiropractor? In this post, it is my hope to not just emphasize all of the benefits of chiropractic care but rather, clear up once and for all WHY your chiropractor makes adjustments, realigns your spine, and relieves neck, back, sciatic nerve pain. So lets start with the basics, chiropractors adjust the alignment of the spine to help the body function at an optimum level and facilitate proper function of the nervous system. Chiropractors are trained to focus on the relationship between structure and function. This delicate relationship between structure and function preserves and restores health. But WHY Does Adjusting the Spine Allow the Nervous System to Properly Function? When your spine is perfectly aligned, important nerve signals are able to be transmitted without any interference, but when your spine is out of alignment, the nerve signals have trouble transmitting. Lets use an analogy to clear things up. One of my personal favorites is comparing your spine to a garden hose. So, think of your spine as the hose and and the flowing water as the transmission of important nerve signals. When you kink the hose, or throw your spine out of alignment, the water (aka nerve signals) has difficulty getting through. The severity of the kink, or misalignment, can determine the severity of your pain and suffering as well as the total overall function of your autonomic nervous system. One of the most common examples of this is sciatic nerve pain. 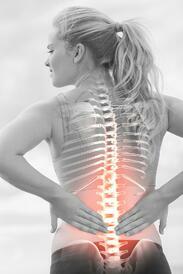 Disorders that cause sciatica include lumbar sublaxations and bulging, herniated, or slipped discs. Below is an infographic that goes into a lot of detail about how each segment of the spinal column affects a given body function that runs along a particular nerve channel. If you are experiencing pain or any of the symptoms mentioned above, talking to your local chiropractor might be the next step to take. If you live in Georgia or Tennessee you can check out our locations here or click on the link below for a Free Consultation with Arrowhead Clinic! Have A Second to Share? What did you like about the post? Is there something else we could have covered?